For this particular venture, my baking coincided with Father's Day, so I decided to make a multitude of cookies to give as gifts to my dad and grandfather. Low and behold, they loved them all, barely able to decide on a favorite. So while I have a couple that stood out as "best" in my mind, let me take you on a tour of my "cookie carnival," which was a battle of recipes: vintage versus modern. The vintage ones are listed first, then the modern, and finally, an ultra-modern, made-to-be-gluten-free cookie that is on the menu at the restaurant Untitled, at the Whitney Museum, in New York City. When I found the recipe online, I couldn't resist including this one as well. 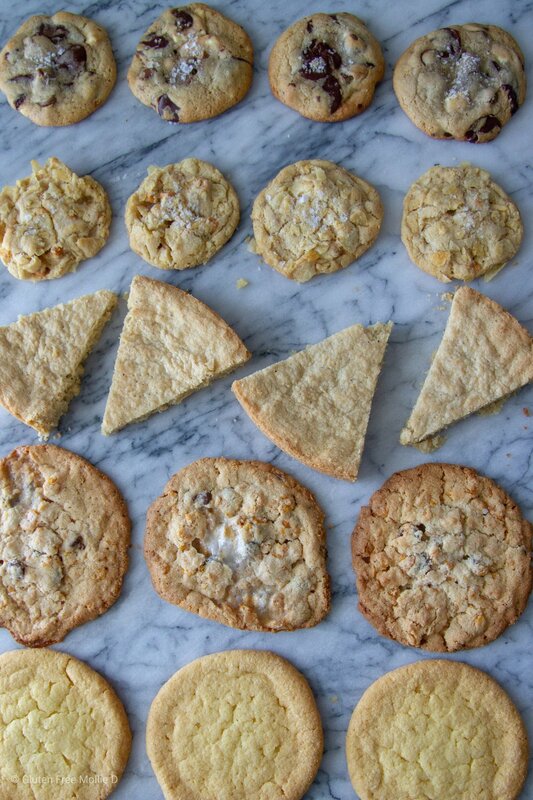 Yes, five kinds of cookies were made in well under under 48 hours. Was it little nuts? Yes. Are there any nuts in these cookies? Nope. Let's get to the sweets! GFMD Taste Test: What a joyful little cookie! 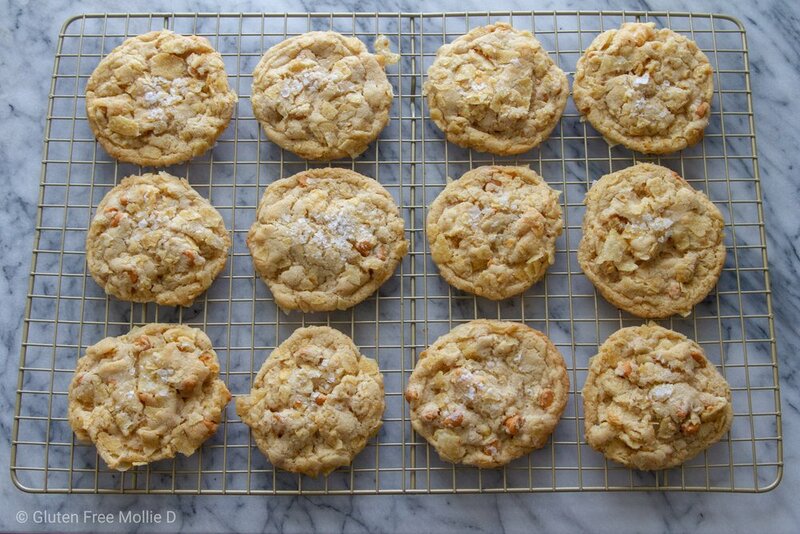 Crispy all over with a sweet + salty combo that even tastes like a vintage-style cookie. I've never had a cookie rolled in potato chips and now I'm beginning to wonder why. And, for those chip-lovers, there is plenty of butterscotch in these snack-able wonders to hit every sweet tooth. Tip for Bakers: I followed the recipe as written with the only change being the flour. I used Cup4Cup gluten free flour, but no other changes were necessary. Also, the recipe calls for kettle-style potato chips. I chose to use Cape Cod Potato Chips, kettle-cooked variety, which I think worked really well. However, I bet another brand's kettle-style would be great, too. Just make sure your chips are labeled GF! There's no reason gluten should appear in chips anyway, but double-checking is a best practice I follow. May I suggest? I loved the potato chip element of these cookies. It's a surprise and at first you're not entirely sure if potato chips belong in a cookie like this, but believe me, it works. And while the butterscotch is yummy, I think my next batch will include chocolate instead. I think a bittersweet chip may create a different kind of salty + sweet pairing that could be even more delicious. GFMD Taste Test: Wow! This one was a real surprise. While I have made shortbread before, I really like it, I had never incorporated lemon or pepper into a cookie. Why not? I have no clue! Adding these elements into shortbread created an awesome, bright flavor from the lemon and a peppery, "spice" from the plentiful amount of pepper. A combo that worked oh so well and made me realize that I need to have this shortbread on hand for all future gatherings. Plus, it was so easy to make! Tip for Bakers: For this recipe, the only change is to use gluten free flour (I use Cup4Cup) and the rest is good to go. It's very important to chill the dough in its pan for the recommended several hours prior to baking. I've noticed with a lot cookie recipes lately that chilling the dough for a while before baking is critical to the success of the final product. And this shortbread is no exception! Also, I chose to use a round 9'' cake pan for my shortbread so that it came out looking slightly pie-ish, despite the recipe listing a square one (I need to buy one). I think that made it more fun! Besides, who wouldn't want a pie-style slice of shortbread? I thought it made the cookie even better! Don't forget to pre-score the slices prior to baking as well as poking them with the tines of a fork. These tips are important to the final success of your shortbread. May I suggest? 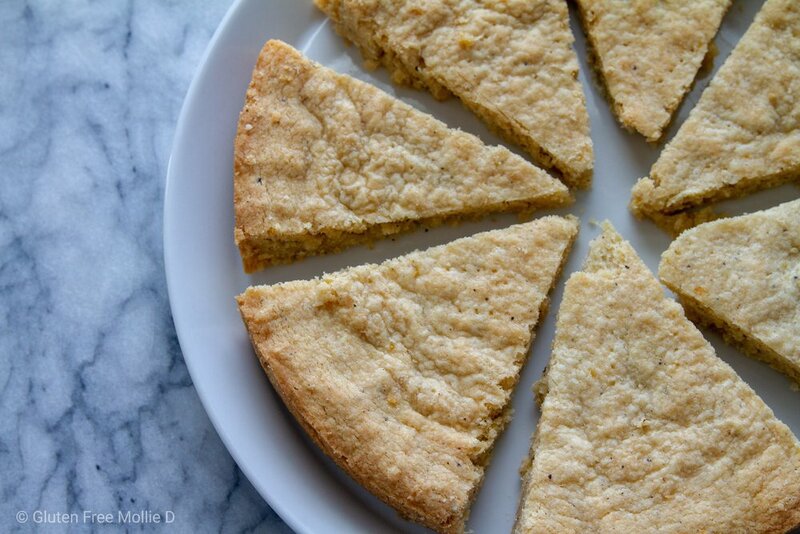 This shortbread was a crowd-pleaser from first bite to last as everyone loved the texture, flavor, and overall buttery-lemony-pepper notes throughout the cookie. In fact, this may be one of my go-to recipes when making a non-chocolate dessert for a party. Clearly, a non-chocolate dessert isn't too common, but there are definitely people out there (myself included) that would prefer a shortbread for dessert rather than a slice of chocolate cake. But now that I think about it, I might as well just make a dessert buffet and offer this shortbread and chocolate cake. Because everyone loves variety! GFMD Taste Test: You know, I would not naturally choose to put all of these ingredients into one cookie, but I am very glad someone did because it's awesome. So many different textures and flavors in every bite, the star being the surprise that it works so well. 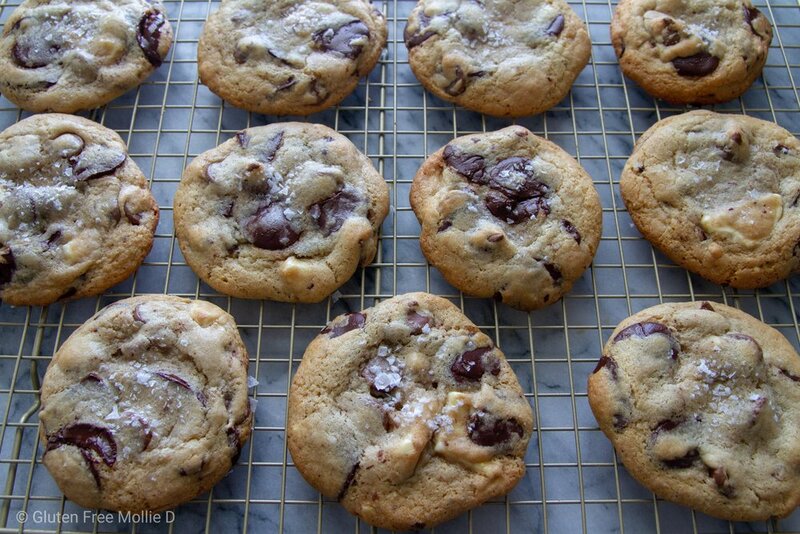 Not the quickest cookies to bake, but the results are so worth it. And in the process of making them, you learn about "cornflake crunch," which is a salty, buttery, crispy creation that I ate while standing in my kitchen for days after the cookies were made. It's a necessary element of the cookie and now a necessary element of my life. Overall, these cookies were terrific once you let go that it will not look exactly, or taste, like a traditional cookie. This is a modern interpretation of a classic cookie (I think) and it's stellar. It's also going to be a new favorite. Tip for Bakers: I learned that all recipes (so far) that I've made from this book require a lot of steps, patience, and excitement, because despite the somewhat involved process, the cookies themselves will turn out deceptively simple-looking, but be a major flavor success. Use gluten free flour wherever it says to use regular, and make sure to buy gluten free cornflakes (we buy Erewhon brand) so that your cookies are truly gluten free. Also, milk powder is a thing and it is easily found (GF too!). Don't question the ingredients, just follow the recipe and you'll be snacking in no time. Well, not no time, because the dough has to chill. But you know what I mean. These salty, buttery, sweet wonders are worth the time and effort requested. And just so you know: baking marshmallows in cookies will smell like your cookies are burning. Don't worry! They are not. But I would recommend baking them for less time than indicated. I ended up baking them for about 16 minutes rather than 18. The longer time resulted in over-crisp edges and ingredients that seemed unhappy. May I suggest? I would recommend these for a fun showstopper to bring to a party (or kid-friendly event) - no one will be able to tell how they were made, but they will all know that they want another one. GFMD Taste Test: As soon as I saw this recipe I knew I needed to bake them. You see, I was a frequent customer at the original Milk Bar, located in Manhattan, way back in 2008. I was living in NYC (not gluten free) and would often find myself wandering in the Milk Bar neighborhood, unable to resist the incredible number of delicious scents wafting through their doors. One in particular was the corn cookie. Not too sweet, not too salty, it was a cookie that appeared fairly plain, but upon your first bite, you knew it was anything but. And now that I have the recipe, I can make the GF version whenever I feel like traveling back in time (to 2008). Tip for Bakers: For these cookies you will need to buy corn flour and free-dried corn powder, both of which are available gluten free. We found them on Amazon.com as well as at Whole Foods. Freeze-dried corn powder is basically creating powder from freeze-dried corn. Buy the freeze-dried corn, throw it in your blender or food processor, and a powder will be made. Ta da! Also, be sure to use gluten free flour, of course. Otherwise, the making + baking process is fairly similar to that of the other cookies in this book. Once all ingredients are combined to form the dough, you'll portion it out onto cookie sheets, pressing down slightly on each dough "dome" to just barely flatten it, and then refrigerate for a while. You'll bake the cold dough for a little under the recommended 18 minutes, or just watch them carefully. Once done, let the cookies cool completely before moving to a cooling rack. You will barely be able to wait that long, but trust me, these are worth the wait. May I suggest? Not only are these corn cookies simply fabulous, they're a real favorite among those who inhaled them. My dad and grandfather loved them so much that my grandfather asked for an entire batch in addition to the few I included in his "cookie bag." GFMD Taste Test: This recipe, bless it, is entirely gluten free, so it prominently features Cup4Cup gluten free flour. No need to change anything in this one as it was made specifically to be gluten free! How nice! The restaurant, Untitled, at the Whitney Museum, offers this cookie on their dessert menu and is served with a chilled glass of milk. Such a traditional combo, but is quite possibly the most delicious cookie I've ever eaten. When Seth and I had lunch at Untitled, we primarily went for this cookie. The lunch was great, of course, but this cookie was a knockout. We ordered one for each of us and one for the road (hey, it's called vacation). That third one didn't make it to the road; we ate it before we even got the check. So, my friends, you can now somewhat conceptualize my excitement when I found this recipe on the Bon Appetit website, just waiting for me to bake it. Over and over again. Tip for Bakers: Now, the road to greatness isn't a fast one, and this recipe does take a little time. Seems to be a theme for all of these recipes, don't you think? So make sure you don't need these cookies immediately because you cannot have them immediately. Once the dough is made, it will smell so good, it will need to chill in the fridge for 8-12 hours. I know. That seems so long. I'd recommend making the dough the night before you want to eat them so you'll be sleeping when the dough is taking it's required chill. Then, once that time has passed, you must let the dough come to room temperature before portioning it onto cookie sheets and baking. I know! So much waiting and time. But don't worry, the resulting cookie will be so scrumptious you will all but forget about the hours and hours that it took to get to that moment. May I suggest? My personal preference is to eat the cookies quite soon after they are out of the oven, so they're still warm and a little extra-soft in the center. This is very close to how they are served at that restaurant and is probably why they're so irresistible. Coming up soon in Baking is my first attempt at blueberry muffins, a new version on a classic cookie, and my adventures in pie-making are finally going to take shape. Stay tuned!